As the old proverb says "All work and no play makes Jack a dull boy" - although most of us probably remember it from The Shining. Well, it's true for me too (minus the insanity part). I realize that with this unique time in my life, I should probably do some things that are otherwise difficult to do with a full time job - or at least some things I've been putting off. I've taken other long motorcycle trips, but never solo. This was going to be challenging on several fronts: What to pack?, where am I going?, which route to take?, what weather would I have to deal with? I chose Sequoia National Park as my destination. There is quite a bit of management involved in planning a motorcycle trip, especially one where you plan to sleep outside. You have a very limited amount of space in which to pack so everything you bring must serve a purpose. Overpacking and underpacking are both serious problems in this case. 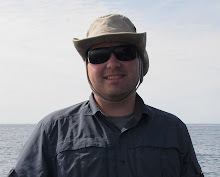 I spent a few days prior to the trip mulling over what gear to bring. Turns out I did a fantastic job packing. I used just about everything I brought, except -thankfully- for things like the First Aid Kit. 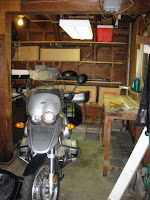 A real space saver on a motorcycle is to forgo the luxury of a tent, and use a bivy sack. Sleep gear will take up the most space out of everything. 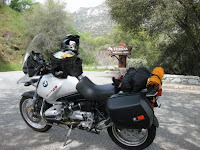 After riding through Sequoia, I heard from other travelers that the pass through Yosemite was clear - so made a change in my route so I would go through Yosemite before ending up in the western Sierra foothills. What a fantastic decision. Not only was I blessed with spectacular weather, but riding through Yosemite on a motorbike (during off season) was an unbeatable experience. I spent a night with some friends in West Point, CA - and then the next day made my way back home to SF. It was raining, and I was prepared to drive in the rain - however, I was NOT prepared for the major storm I encountered in Stockton. The sky was black and it opened up with wind, rain, hail, and lightening while I was on I-5. Could not have been worse timing. The wind was pushing me out of my lane and the hail was pelting me. I slowed to about 45 MPH which made it even more dangerous as cars continued to pass me at > 60 MPH. The ironic thing is that if I looked west, I saw sunshine. I was literally a 1 minute drive away from being safe - I just needed to get west. I made it to I-205 and got west and out of danger, only minutes before I was going to pull over. It was perhaps the most harrowing experience I have ever had on a motorbike, and one in which I definitely earned a merit badge! Here are some random thoughts I had during the trip. Being alone for a few days on a motorbike definitely gives you time to think. I wrote a lot of it down. I've got pictures posted from the trip that you can see by clicking HERE. Also, see video posted at the bottom from Kings Canyon. Riding from water into sand will make you slip. Sleeping in a bivy is more challenging than a tent but on a night when the stars are out, it's way worth the hassle. Self registration in National Parks: YES, they will check. Plan your cooking so all you really have to do is boil water. Earplugs on the freeway might be a good idea; not for engine noise but for wind noise. Use everything you bring; or don't bring it. Leave your campsite in better condition than when you found it. Having a bug fly into your helmet can be catastrophic! Building a campfire is more art than science. I question the wisdom of wearing headphones for music while riding, ut it can save your sanity on the long stretches of nothing. 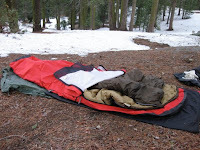 Camping in the snow is not as bad as it sounds. I hate tree sap on my hands. Sometimes the most unexpected part of your trip turns out to be the best of the day. There are few Americans in our National Parks. Driving in the city is definitely more dangerous than driving on the freeway. Chevron = favorite gas station. The gas is quality and they always have a decent bathroom.